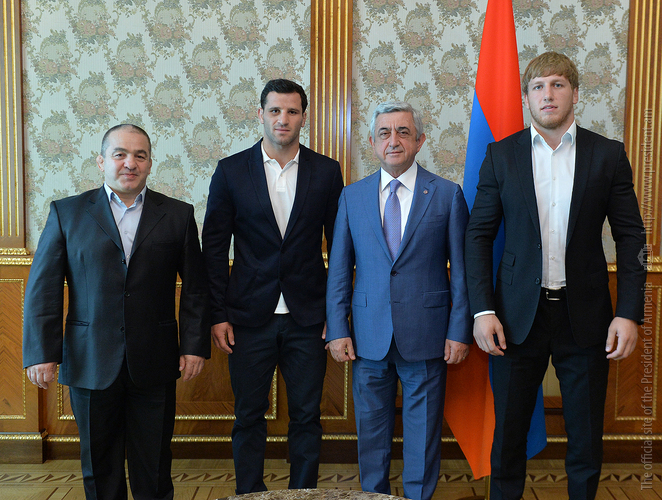 President Serzh Sargsyan received today World Wrestling Champions Artur Aleksanyan and Maksim Manukyan. Head coach of the Armenian national team Levin Julfalakyan and Minister of Sports and Youth Affairs Hrachya Rostomyan were also present at the meeting. President Sargsyan congratulated the sportsmen on the brilliant results and thanked them for the moment of joy and pride, as well as for making the Armenian people better known to the world. The President said the victories will serve a landmark for children and youth, encouraging them to be more hard-working and purposeful. Issues of ensuring better conditions for the development of wrestling were discussed at the meeting. The guests expressed gratitude to the President for his constant support for and the development of sports and his attention towards sportsmen, noting that it encourages them to achieve better results. Artur Aleksanyan and Maksim Manukyan claimed gold medals at the 2017 World Wrestling Championships held in Paris.